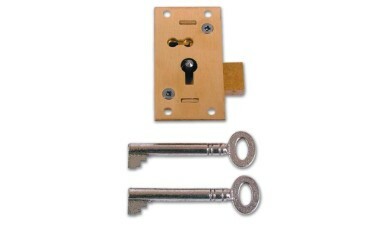 The Aldridge 51 4 Lever Straight Cupboard Lock is a budget range cupboard lock offer great value. The Asec 51 4 Lever Cupboard lock offers better security.Operation Deadbolt is locked or unlocked by key. The Aldridge 51 4 Lever Straight Cupboard Lock is a budget range cupboard lock offer great value. The Asec 51 4 Lever Cupboard lock offers better security. Hi guys. My name is Darrel. I'm head of the tech team here at LocksOnline.co.uk and thanks for tuning in and we are doing product reviews today. The product that we have in front of us is what we call in the industry a straight cupboard lock. Obviously designed to fit on cupboards and so forth. So without further ado, let's get it up and let's have a look it. Now, this particular lock is a little bit different in as much as that, it's got a degree of security about it. Most of these cupboard locks, the security isn't that great to be honest with you. But this particular lock here has got a four-lever mechanism built inside. So when you are thinking of wanting something that's a little bit harder to manipulate or to try and get through or something like that, then this is the lock that you need to be considering. If you are looking at having a drug cabinet or something similar like that inside your home or whatever and you want that little bit of extra security, then this is the sort of lock that you should be considering. Now, it comes in three different sizes as standard. The one I have here in front of me is the 75-millimetre version. It's measured this height is the size. It comes in a 64-millimetre version, which is a bit smaller and obviously a 50-millimetre version as well which is smaller again. 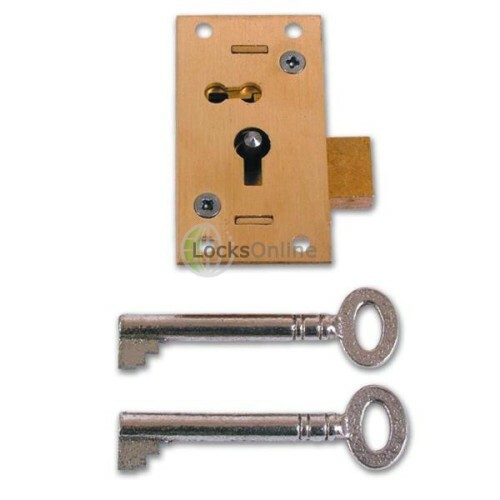 Now, as they go down smaller, they also, the backset which is from the leading edge here, to the keyhole changes and we've got charts on our site that you can follow that if you want a smaller lock then you can work out what that backset measurement is. But on this particular one, I'll get you an idea of how you measure the backset and it's from the centre of that pin there and the centre of the keyhole to the leading edge here and the measurement we've got here is 20 millimetres. Now it comes as standard with two keys as standard and as you can see, the actual complexity of the bit on the end of the key is a little bit more pronounced than what you would expect from a one or a two-lever lock. So therefore giving a more degree of security. Now these particular locks are not handed. You can use it in any hand, so if the door opens that way or if the door opens that way, what you would basically do is that when you unlock from this side, you're technically locking from, then going to lock that side. So, you know, if the door is opening like that, you can lock then either side, so it's not really much that you can say about that. It comes standard with four fixing holes as you can see there and if I give you some sort of idea of those fixing centres, we've got there, give or take 16 millimetres just off there and fixing centres on it's length there is 64 maybe 63 millimetres, 63 - 64 millimetres. So if you're thinking of replacing it so it looks like the one that you want to replace, then this is the body for you. If you're thinking of fitting new as well, and you want to make a tidy job of the hole, but were drilling into the cabinet to put the key into, we do, as an extra, if you wanted to, we do these little rosettes here, these little escutcheons. So you would drill your hole quite accurately if I have to be honest with you. I'd struggle myself but if you're a joiner or a carpenter, you can make yourself a fine little hole there and these can be tapped in and the idea is then is you've got a nice brass finish there around the hole, just finish the whole job off. So, there you go. Like you see, it's more of a security option for you on this particular lock. 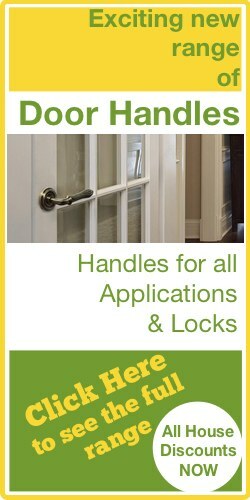 If you need that little bit of extra security etc., then go for the four-lever option. That's enough from me now. I'm going to finish here, but if this is for you come and click 'Add to Cart' on our site. We'll really appreciate it. Anyway, from me Darrel Walters, take care and come back really soon. Bye-bye now.